Italy is one of the most visited countries in Europe. A remnant of the Roman Empire, Italy has many attractions to offer, from historical cities to delicious food. Rome, which is the capital city, is a beautiful location filled with Roman ruins, beautiful architecture, and, of course, the Colosseum. However if you ever travel to Italy, do not spend all your vacation in Rome. Venice is located in the north of the country, but it is a trip worth making. The tower of Pisa, Sicily, Napoli, and many other locations can help you create beautiful memories. You cannot possibly see everything worth seeing in one trip, but you must at least try. You will not regret it. But before you go to Italy, you must solve the documentation issue. You may have to get a visa to enter the country. Since Italy is in the Schengen Area, you need a Schengen visa. That may not be the case if you find yourself in one of the following situations. One, you are from a country that is a member of the European Union, in which case you do not need any documents, not even a passport; and two, you travel from a country that is in the visa waiver program. If none of the situations apply, your only choice is to obtain a visa. To find out if you need a visa or not, you can read the visa policy of the Schengen Area. Better yet, you can use iVisa’s Visa Checker. It is a simple tool that you can see in the top right corner of this page. Once you access it, select your country of origin in the left box and pick Italy for the box on the right. The results will tell you whether you need a visa or not. Moreover, if you do need a visa, you will be given a list of the nearest embassies. 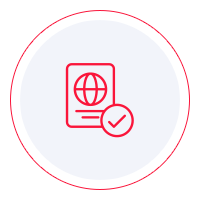 Schengen visas cannot be obtained online, which is why we cannot process Schengen visa applications. Even so, we like to be as helpful as we can, which is why we would be more than happy to provide information. Our support service is at your disposal 24/7, and it is entirely free of charge. One thing that is worth mentioning is that a Schengen visa that grants you entry in Italy does not have to necessarily be obtained from the Italian embassy. Of course, if you plan to go to Italy only, then the Italian embassy is the logical choice. However, if you decide to travel to multiple European countries, your choice of an embassy can differ. So, your visa must be obtained from the embassy of the country that is your primary destination. In case that cannot be established, you need to submit an application at the embassy of the country that you visit first. For example, if you travel to Germany, France, and Italy, a Schengen visa issued by the German embassy grants you entry in all three countries. Unfortunately, that is all we can provide at the moment, but we hope that the information above comes in handy.